Henry Franklin Parsons and his wife, Louisa Anne Parsons née Wells. Born Bockington, Somerset, on 27th February 1846, eldest son of Joshua Parsons (a surgeon with an interest in the local natural hsitory), and Letitia H Parsons (née Williams; married 10th April 1845). Studied medicine at St Mary's Hospital, London, awarded MD in 1870. In medical practice with his father in Beckington, 1867-73. Appointed Medical Officer of Health, Goole and Selby, Yorkshire, 1874. 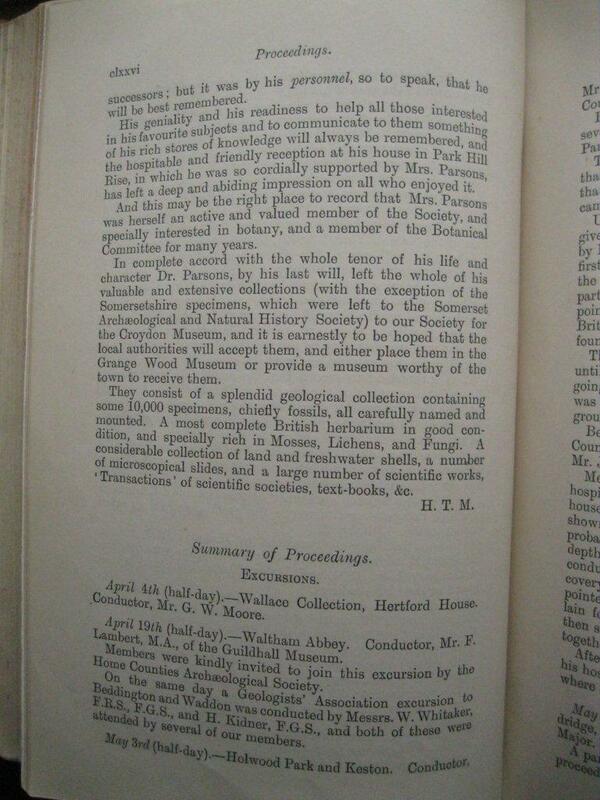 Fellow of the Geological Society 1877. Married in 1879 to Louisa Anne Wells, eldest daughter of John and Eliza Wells of Booth Ferry House, Yorkshire (daughters Edith G and Florence H Parsons). Elected member (18 May 1881) and President (1912) of Croydon Natural History and Scientific Society. Lived in Whitworth Road, South Norwood, and later in Park Hill Rise, Croydon. Died 29th October 1913 at his home in Croydon, burried at Frome, Somerset. Parsons' grave in Frome Churchyard. Search for specimens collected by Henry Franklin Parsons. Obituary "H. Franklin Parsons F.G.S. ", by Henry Tuke Mennell, (1914). Proceedings and Transactions of the Croydon Natural History and Scientific Society, 7(5), pages clxxiv, clxxv, and clxxvi. Obituary Geological Magazine (1913) 10(12) pp 575-576.. Article on Dr Joshua Parsons in Somerset Archeology and Natural History, (1996) 140 105-119. Includes photographs of Henry Franklin's birthplace and as a child with his mother.